Karmik is the new multi-brand pret store. The Karmik Show featuring exclusive designs by India's leading designers was presented on Day 4 of Lakme Fashion Week in Mumbai. Karmik will house exclusive designs by 12 designers including Rohit Bal, Anamika Khanna, JJ Valaya, Rina Dhaka, Neeta Lulla, Falguni & Shane Peacock, Rocky S, Shantanu & Nikhil, Ranna Gill and Kavita Bhartia. Sonakshi Sinha walked the ramp in a JJ Valaya for Karmik creation. Archana Kochhar showcased her collection "Kathputli Kathak" on the last day of Lakme Fashion Week Summer/Resort 2012. The designer took inspiration from the colors of Rajasthan and the swaying movement of a classical dancer for her creations. Bright embroidery in pinks, blues and yellows on contrasting stark white was the prominent theme in her clothes. 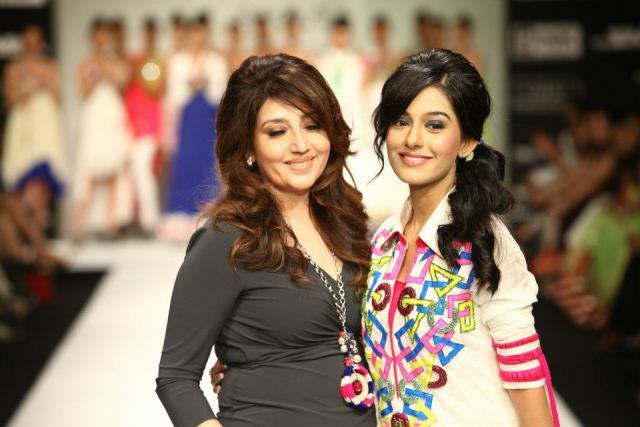 Amrita Rao closed the show in a beautiful outfit for Archana Kochhar. Kolkata based designer Neha Agarwal presented her Summer/Resort 2012 collection on Day 4 of Lakme Fashion Week in Mumbai. She had an interesting mix of Indian and western wear with prints dominating the collection. The leaf print in black, white, green and orange is quite wearable. Narendra Kumar showcased his Spring/Summer 2012 collection on Day 4 of Lakme Fashion Week. What I loved about this show was the infectious energy. The models came down the runway swaying to "Moved Like Jagger" with the designer himself playing DJ. I always associated Narendra Kumar with dressing Dhoni on his wedding day and now I think I'll associate him with color :-) The designer clearly wants men to embrace color and inject some life into their wardrobe. He presented strong looks with Khaki pants, bright shits and slim fit jackets in contrasting colors. He also created lots of band collar jackets for men. Nice touch with the vivid pocket squares. Delhi based designer Siddhartha Tytler showcased his collection on Day 4 (March 5, 2012) of Lakme Fashion Week in Mumbai. The designer presented a sophisticated range of looks in intricate prints and some unique color combinations all cinched at the waist. The highlight for me was the little black dress with embroidered jacket look on Sonali Bendre. Sonali Bendre really was everything a show stopper should be. She had incredible energy and walked the ramp with unapologetic confidence. 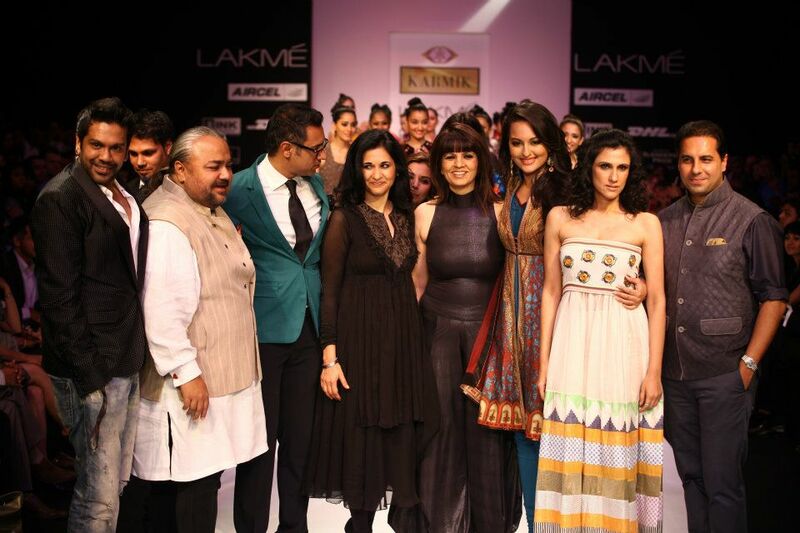 Rocky S presented his collection on Day 5 of Lakme Fashion Week in Mumbai. When I saw the dried leaves on the runway, I instantly thought of Autumn and Fall but as the music started and a husky voice repeated the designers name "Rocky Star" I realised the dried leaves were to create the haunting mood for his 'Corpse Bride' collection. Rohit Bal showcased his latest collection at the Grand Finale of Lakme Fashion week last evening with a spectacular show. I probably took down the least number of notes while his runway show was on cause I watched with such rapt attention and in awe of the stunning clothes that came down the ramp. Arpan Vohra presented his collection called “Back to the Hourglass” at Lakmé Fashion Week Summer/Resort 2012 in Mumbai. Her collection was truly unique, original and twitter was abuzz with praise for her from fellow artists as well as designers. Metallic eggs on gold chains, filigree windows, doors and chained feet made for some bold statement pieces. What do you think? Ruchika Sachdeva presented her label BODICE's collection on Day 4 of Lakme Fashion Week. Yes the lips, you can't miss em, obviously what struck me first when the models walked on to the runway. A collection consisting mostly of coral, grey and black outfits. Some thigh high slits and unusual cuts on the looks. BODICE has strong working woman vibe with a hint of men's tailoring. Former stylist and fashion writer, Nupur Kanoi, showcased her latest collection on Day 4 of Lakme Fashion Week in Mumbai. Nupur Kanoi's style is usually described as "the discordant harmony between contemporary and traditional imbued with a sense of fun." Nupur Kanoi's collection "The Kundalini Project" was inspired by Vedic symbolism, conciseness and energy. The irregular hem-lines, monochromatic color palette and the extensive use of checks with what struck me first about her collection. Day 3 was Indian Textile Day at Lakme Fashion Week. Sashikant Naidu presented his collection titled "Duality" on showcasing of the beauty of his home state Andhra Pradesh. The collection was mix of Ikat, Kalamkari, and Khadi and the designer accented the looks with Lambada jewelry. Traditional colours of yellow, orange, blue, green and red all created with natural dyes were used to create the rustic prints on the ensembles. Anita Dongre closed Day 3 of Lakme Fashion Week in Mumbai. Her collection titled "Waves of Joy" was showcased along with a 3D display of Godrej Interio furniture. Model/Actor Dipanita Sharma opened the show in a Lemon dress and closed the show in a colorful sari. Lots of pretty day time options. I really liked that she put slash pockets on her dresses and skirts, made the look a lot more casual and fun. The show also marked the debut of Anita Dongre's menswear collection. The men walked down the runway in white pants and band collar pastel shirts. She also presented a range of summer suits in black and white for men. Purvi Doshi presented her collection called “Chalval” meaning movement at Lakmé Fashion Week Summer/Resort 2012 on March 4th, 2012. Models sashayed down the runway to patriotic songs with hints of the tricolor featured on the khadi garments. Purvi Doshi's collection was inspired by elementary geometric shapes such as the circle, triangle and square. The designers artistic tribute to Khadi featured swirling cropped blouses, asymmetric tunics, pleated dresses, one shoulder togas with contrast tones, panelled empire line creations, multi tiered and layered midis and saris with splashes of color. Known for her path breaking interpretation of contemporary jewelry, Suhani Pittie presented her latest creations at Lakme Fashion Week. I am not a fan of gold jewelry as such but liked her use of the precious metal. The jewelry designer has been recently selected by the World Gold Council as one of the world's Top 10 Most Inventive and Ingenious Jewelry Designers. The styling of the jewelry was quite eye-catching with cuffs worn over the shirts. Loved the gold hair bands. :-) The models walked down the runway in black and white ensembles designed by sister Anamika Khanna. Payal Khandwala presented her Spring/Summer collection on Day 2 of Lakme Fashion Week. As a painter, her creations are inspired by human form, color, texture and structure. She presented a line of separates draped and layered on the models artistically. A lot of rich colors and some unique combinations. Interesting detailing with the zipper showing in some pieces. New York based luxury designer Bibhu Mohapatra presented his Spring/Summer 2012 collection at Lakme Fashion Week in Mumbai yesterday March 3rd, 2012. A regular at international fashion weeks this is Bibhu Mohapatra's first showing in India. Having dressed the likes of Angelina Jolie, Sienna Miller, Cate Blanchett and more recently Deepika Padukone, the designer has generated a lot of buzz for showing at Lakme Fashion week. Nargis Fakhri and Jaya Bachchan were spotted at the front of his show. I loved his show for the understated confidence in the looks. The creations had flattering silhouettes with a unique combination of pleats and drapes. The chiffon gowns with crystal embroideries were beautiful and I particularly liked the slouchy pants.